Harman international is a known player in the marketplace for audio systems. This month, Harman is making news over a patent filing proposing how to make virtual reality sounds more realistic. "Mobile speaker system for virtual reality environments" was filed in January last year by Harman International Industries, Stamford, CT, and dated March 5 of this year. The product goal is better sound in a virtual environment. What is the concept? 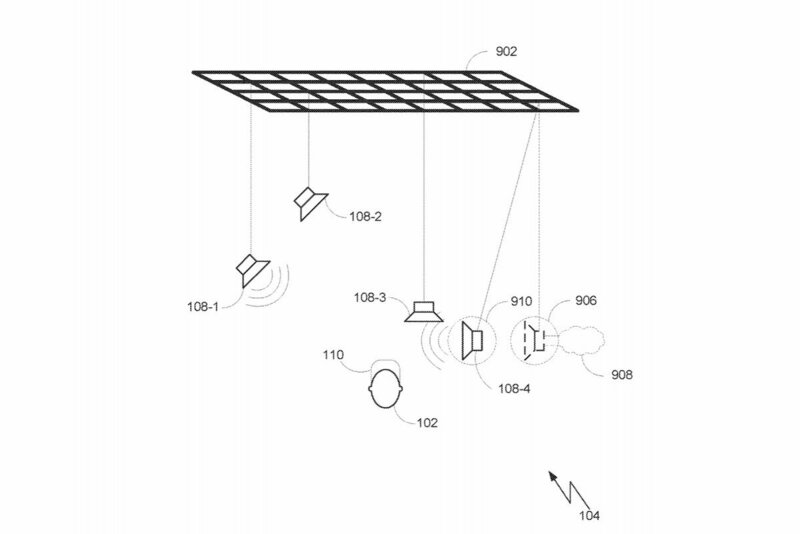 The patent involves mapping sounds from virtual reality games to one or more robotic speakers. The speakers could move and hover around the user with the help of quadcopters or gas jet based propulsion mobility platforms. A hovering mobility platform could be based on co-axial rotors, multi-rotors (e.g., quadcopters), or vertical gas jet based propulsion mobility platforms. Christine Fisher in Engadget explained this concept: "Imagine you're using a VR headset and as a car races past, you hear it whip from left to right. Only the sound literally moves from left to right because it's coming from a robotic speaker that zips across the room." In practice, "the company would map VR soundscapes to robotic speakers, which would either drive or fly (thanks to quadcopters) to better represent the distance, direction and movement of sounds." After all, virtual reality is one experience where the player is likely to move, move, move PCMag said, "The person wearing the headset hardly ever remains in one fixed location, so why should the speakers?" Matthew Humphries in PCMag wrote, "unlike traditional forms of digital entertainment, the person isn't sitting still. Harman, a subsidiary of Samsung, has been awarded a patent that allows sound to be much more realistic during VR sessions by letting it move around." Senior Silicon Valley correspondent, Janko Roettgers, considered results if this patent were to go to a real product development stage. Roettgers said this would mean "a wide range of acoustic phenomenons." They might be objects emitting sounds themselves; walls that sound can bounce off; physical obstructions absorbing sound. The patent news is an interesting reminder, too, of the shortcomings perceived in conventional virtual reality systems, regarding sound. Harman's patent idea would seek to remedy that. In conventional VR approaches. there is audio content via "static audio devices." User's headphones or stationary speakers are static audio devices. The drawback is that the audio content via such static devices may not accurately represent the virtual environment or virtual objects in the virtual environment. Traditional speaker systems may not achieve the realistic sounds that might be enjoyed via Harman's idea. "For example, sounds outputted by stationary speakers may not accurately reflect the distance, direction, and/or motion between the user and a virtual object included in the virtual environment." In spatial audio, this would be a step up. The patent noted the fundamental result that can benefit AR, as "the audio that the user hears matches more closely with user expectations for the audio based on what the user sees in the virtual reality content. Consequently, the audio facilitates a more immersive virtual reality experience." Robotic speakers whizzing around, moving from location to location, ejecting a gas jet? The patent mentioned in some embodiments, the mobility component may include a gas propulsion system that moves air in the physical environment such as propellers, rotors and fans. In some embodiments, it said, the structure may, instead of wheels have articulated robotic appendages for movements. Sound is a terrific word but noise is not. Discussing the patent idea, Jon Porter in The Verge wrote, "the idea sounds awfully noisy, and all of these rotary blades and jet engines risk drowning out the audio from the speakers." Shawn Knight in TechSpot brought up noise too ("Granted, noise cancelling components would be needed to reduce the noise from the propulsion systems") but Knight also commented that by the time this comes to fruition, if ever, "aerial drones may be much quieter than today's examples."